According to an article on the .ME Registry blog, a company called ReturnMoi has rebranded as ReturnMe, and the company is now using Return.Me for its website. The company had been using ReturnMoi.com, and that domain name now forwards to the new domain name. The Return.Me domain name was a name that had been reserved by the .ME Registry as a premium name. Neither the blog post nor the press release discussed the price or terms for the deal that landed this company the Return.Me domain name. The ReturnMe.com domain name appears to be owned by a different entity that is based in New York City, and judging by the message on its home page, it looks to me like that company does something similar. Returning ReturnMoi customers will likely not be confused as they are most likely to visit the old domain name, which forwards to the new one. 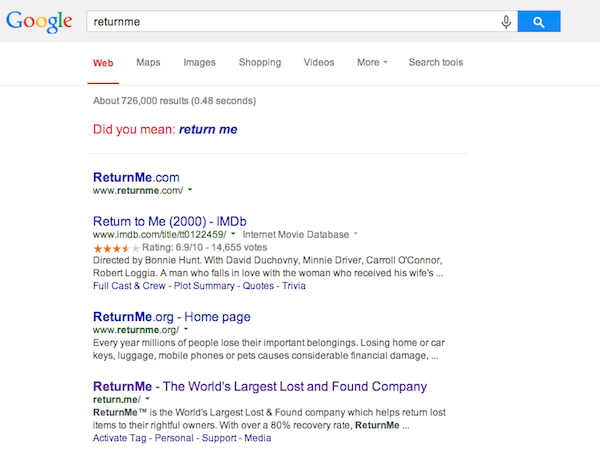 At the moment for me, a Google search of ReturnMe produces the ReturnMe.com domain name as the top result, with Return.Me ranking #4 for my search. Because of the potential for confusion, I hope the recently rebranded company makes sure to emphasize that it can be found on the .ME url. As I mentioned somewhere else, a smart marketer should buy ReturnMe .com LLC (NYC). They will have immediate success. The company seems big enough that they could have bought the .com if they wanted too (keep in mind, the starting price for most ME domains are $20,000) I personally like the Return.Me since it’s part of their name. Premature decision as they have no rights granted to ReturnMe TM and will almost certainly go enter into trademark litigation this month and place the entire business at risk. Plus, http://www.returnme.com domain is now ready and for sale with bids already coming in at premium .com domain prices. Send any offers to sales@returnme.com as bidding is an option depending on multiple party interest.